Not many people know this, but I watch a lot of science fiction films and shows, read a lot of science fiction books, and even play several sci-fi video games from time to time. I thought it'd be fun to do some research to find out as many inventions as possible that were either invented, conceived of, or inspired by the authors of works of science fiction. I think the answer to this question is going to end up being "pretty much everything", but I'll start with this. If anyone else wants to share inventions invented/conceived/inspired by sci-fi writers, whether the work was a book, TV show, or film, go for it. One of the "Big Three" science fiction writers of his time, along with Robert Heinlein and Issac Asimov, he is most famous for having been the co-writer of 2001: A Space Odyssey. From 1941-1946, he served as a radar specialist with the RAF, working with early warning radar defense and ground controlled approach radar. Can Rocket Stations Give World-wide Radio Coverage? ALTHOUGH it is possible, by a suitable choice of frequencies and routes, to provide telephony circuits between any two points or regions of the earth for a large part of the time, long-distance communication is greatly hampered by the peculiarities of the ionosphere, and there are even occasions when it may be impossible. A true broadcast service, giving constant field strength at all times over the whole globe would be invaluable, not to say indispensable, in a world society. Unsatisfactory though the telephony and telegraph position is, that of television is far worse, since ionospheric transmission cannot be employed at all. The service area of a television station, even on a very good site, is only about a hundred miles across. To cover a small country such as Great Britain would require a network of transmitters, connected by coaxial lines, waveguides or VHF relay links. A recent theoretical study 1 has shown that such a system would require repeaters at intervals of fifty miles or less. A system of this kind could provide television coverage, at a very considerable cost, over the whole of a small country. It would be out of the question to provide a large continent with such a service, and only the main centres of population could be included in the network. The problem is equally serious when an attempt is made to link television services in different parts of the globe. A relay chain several thousand miles. long would cost millions, and transoceanic services would still be impossible. Similar considerations apply to the provision of wide-band frequency modulation and other services, such as high-speed facsimile which are by their nature restricted to the ultra-high-frequencies. Many may consider the solution proposed in this discussion too farfetched to be taken very seriously. Such an attitude is unreasonable, as everything envisaged here is a logical extension of developments in the last ten years--in particular the perfection of the long-range rocket of which V2 was the prototype. While this article was being written, it was announced that the Germans were considering a similar project, which they believed possible within fifty to a hundred years. Before proceeding further, it is necessary to discuss briefly certain fundamental laws of rocket propulsion and ``astronautics.'' A rocket which achieved a sufficiently great speed in flight outside the earth's atmosphere would never return. This ``orbital'' velocity is 8 km per sec. (5 miles per sec), and a rocket which attained it would become an artificial satellite, circling the world for ever with no expenditure of power--a second moon, in fact. The German transatlantic rocket A10 would have reached more than half this velocity. It will be possible in a few more years to build radio controlled rockets which can be steered into such orbits beyond the limits of the atmosphere and left to broadcast scientific information back to the earth. A little later, manned rockets will be able to make similar flights with sufficient excess power to break the orbit and return to earth. ONE of the most important branches of radio physics is ionospheric research and until now all our knowledge of conditions in the ionosphere has been deduced from transmission and echo experiments. One of the more modest claims of the British Interplanetary Society was that rockets could be used for very high altitude investigations and it will not have escaped your readers' notice that the German long-range rocket projectile known as V2 passes through the E layer on its way from the Continent. If it were fired vertically without westward deviation it could reach the F1 and probably the F2 layer. The implications of this are obvious: we can now send instruments of all kinds into the ionosphere and by transmitting their readings back to ground stations obtain information which could not possibly be learned in any other way. Since the weight of instruments would only be a few pounds--as compared with V2's payload of 2,000 pounds--the rocket required would be quite a small one. Its probable take-off weight would be one or two tons, most of this being relatively cheap alcohol and liquid oxygen. A parachute device (besides being appreciated by the public!) would enable the rocket to be re-used. This is an immediate post-war research project, but an even more interesting one lies a little farther ahead. A rocket which can reach a speed of 8 km/sec parallel to the earth's surface would continue to circle it for ever in a closed orbit; it would become an ``artificial satellite.'' V2 can only reach a third of this speed under the most favourable conditions, but if its payload consisted of a small one-ton rocket, this upper component could reach the required velocity with a payload of about 100 pounds. It would thus be possible to have a hundredweight. of instruments circling the earth perpetually outside the limits of the atmosphere and broadcasting information as long as the batteries lasted. Since the rocket would be in brilliant sunlight for half the time, the operating period might be indefinitely prolonged by the use of thermocouples and photo-electric elements. Both of these developments demand nothing new in the way of technical resources; the first and probably the second should come within the next five or ten years. However, I would like to close by mentioning a possibility of the more remote future--perhaps half a century ahead. An "artificial satellite'' at the correct distance from the earth would make one revolution every 24 hours; i.e., it would remain stationary above the same spot and would be within optical range of nearly half the earth's surface. Three repeater stations, 120 degrees apart in the correct orbit, could give television and microwave coverage to the entire planet. I'm afraid this isn't going to be of the slightest use to our post-war planners, but I think it is the ultimate solution to the problem. 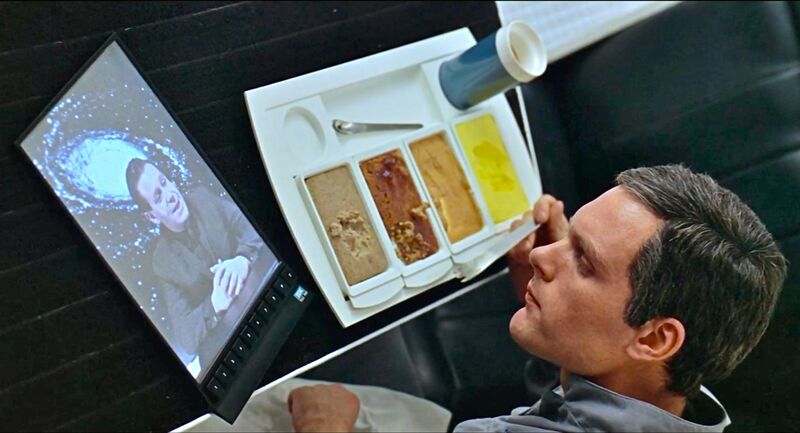 Easter egg from 2001: A Space Odyssey - tablets. Last edited by Ironduke; 18 Jul 18, at 17:18. Father of science-fiction, Jules Verne has invented a lot of things that we use nowadays. But submarines deserve the most attention. In Twenty Thousand Leagues Under the Sea, Verne imagined a great underwater ship called the Nautilus, led by Captain Nemo. The submarine was powered by electricity and contained a grand ballroom and organ. A whole generation was raised by original Star Trek series. This show has given rise to a huge fan community, has inspired a lot of writers. Apart from that, it has given us a Cell Phone. One of the most famous Star Trek gadgets was the “communicator,” which was a wireless phone that looks strikingly similar to many of today’s cell phones. In the classic sci-fi tale of artificial intelligence unfurls that was written by Czech author Karel Capek the existence of robots were predicted. In the Rossum’s Universal Robots people used robots as slave labor. But eventually, they gain sentience and rise up, fighting back against their human creators. And again Star Trek! In the original series, the Enterprise contained a tool called replicator. This device is essentially a 3-D printer capable of creating meals on demand and many other objects. While the 3-D printer has yet to become a household item, it has evolved from the realm of dreams to a reality. In 1983, Chuck Hull invented a 3-D printer that uses photopolymers and ultraviolet light to create any object you can imagine. So far 3-D printers have been used to create everything from working guns to shoes to meat – that’s right, meat! How not to mention Isaac Asimov? In 1964 he penned an article for the New York Times in the paperwriting reviews column, where he was imagining what inventions would be in the world in fifty years. He hypothesized "robot-brain" cars, capable of self-driving. 50 years later we get Tesla cars. In Bradbury’s most famous novel, Fahrenheit 451, he presented a dystopian world where books are outlawed and destroyed by “fireman” in the society. Bradbury also describes how the Seashell radio device is tucked cozily inside the ear. It’s clear he was on to something here, as nearly every person at the gym, on the bus, or jogging on the street sports a pair of ear bud headphones.